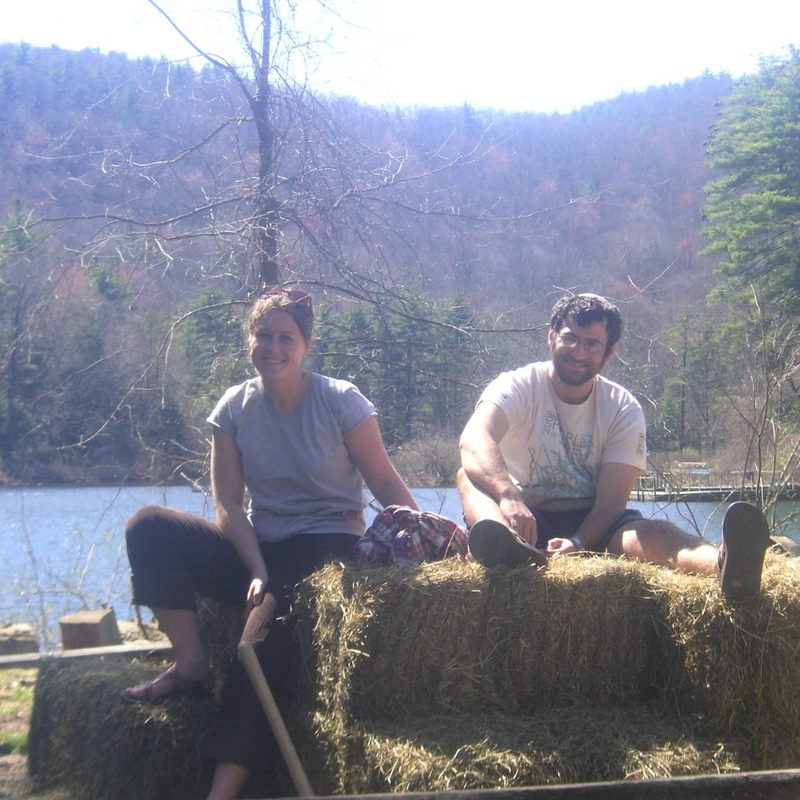 We met on an organic vegetable farm and fell in love. That is, with each other -- and with feeding people good food. Our courtship story went something like this: We are going to get married. We are going to have a farm. We are going to feed people. We went to conferences on how to farm as a couple and grow the best tomatoes. Anna grew vegetables for a CSA. 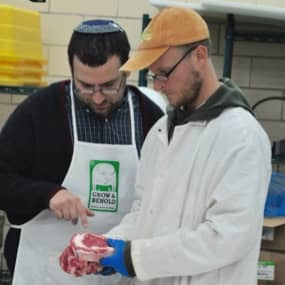 Anticipating that we'd live "in the middle of nowhere," Naf hit the road to learn how to make kosher meat. 'If we're farming', he thought, 'we'll raise chickens, and I'll schecht them for my family, so we can keep kosher and eat well'. How many farmers can also walk to shul and raise a family in a Jewish community? We realized that instead of farming, we needed to start producing kosher pasture-raised meat. Our first year we sold only chicken, which was raised by the farmer who had raised the birds for our wedding and processed at the David Elliot Poultry farm, where Naf trained. Naf traveled the country, meeting farmers raising cattle, lamb, veal and poultry, to find growers who were raising animals how we wanted: outdoors, on pasture, with no hormones, no antibiotics, room to move around, and close proximity to processing facilities to minimize travel. Even though everyone wanted everything right away, we kept saying, "Until we've found the right farmers, we're not adding new products." Year by year, our catalogue expanded. 2011: Beef. 2012: Lamb. 2013: Duck. 2014: Rose Veal. 2016: Beef Jerky. 2017: Dry-Aged Steaks. 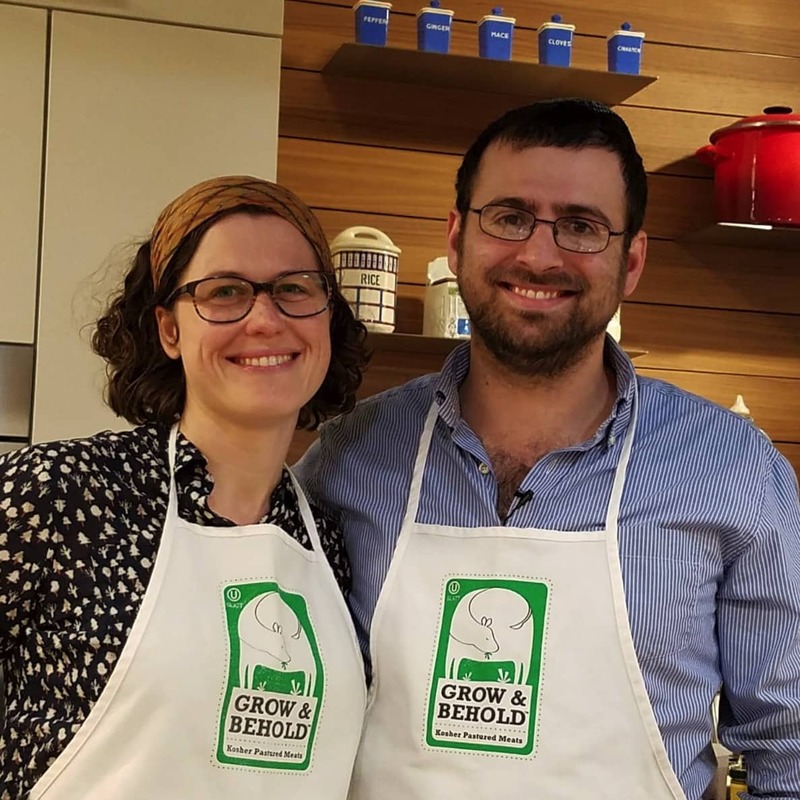 Grow & Behold is the culmination of our decades of passion for healthy, sustainable food, good cooking, and the community that gets built around the table. It is sustained by our deep relationships with our partners, including multi-generational slaughterhouses and family farms. We do not compromise on quality or our environmental standards, because we're producing meat that you trust and that we want to eat ourselves. We take care every step of the way to make sure the meat is raised well, processed humanely, expertly butchered, carefully packaged, delivered seamlessly and prepared with confidence in your kitchen, thanks to our recipes, tips and terrific customer support. It is our great pleasure to bring these delicious meats to your table. We look forward to feeding you soon!